Book Clubs for Inmates (BCFI) began in 2008, when Carol Finlay visited Collins Bay Institution, a medium-security penitentiary in Kingston, Ontario. Meeting with a small group of inmates, she proposed an idea: a monthly book club. To Carol’s surprise, the idea was welcomed with enthusiasm. 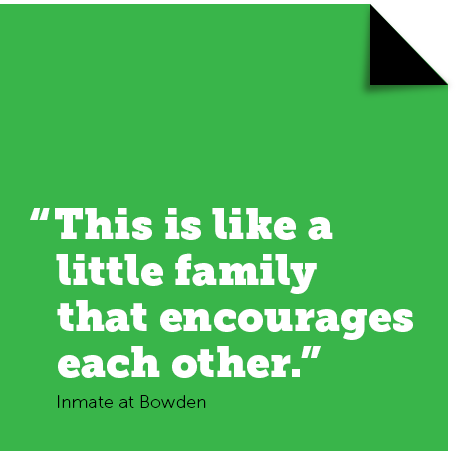 By August of that year, the first BCFI book club, featuring a core group of 12 to 15 inmates, was established. Based on the success at Collins Bay, Carol decided to expand the project. In January 2010, a book club was started at Frontenac Institution, a minimum-security facility. Clubs at Bath Institution and Grand Valley Institution for Women in Kitchener soon followed, while a reading group at Pittsburgh Institution also signed on. In the spring of 2009, BCFI became incorporated and registered as an official Canadian charity. In 2011, book clubs were added at Joyceville, Beaver Creek and Millhaven. In early 2012, BCFI partnered with First Book Canada, a non-profit organization that connects book publishers and community organizations to provide access to new books for those in need. In June 2013, the first book club outside of Ontario was started at Stony Mountain Institution in Winnipeg. In September 2013, BCFI expanded to Alberta with a club in Bowden Institution, Innisfil. In April 2014, the first francophone book club was established in Quebec’s Joliette Institution. Five months later, BCFI opened three new women's book clubs: two at Fraser Valley Institution in British Columbia and one at the Nova Institution in Nova Scotia. Also in 2014, BCFI established the Justice Joan Lax Memorial Scholarship, which helps to fund post-secondary education for inmates during their incarceration. In the fall of 2015, BCFI started new book clubs at William Head Institution in Victoria, at Dorchester Institution in New Brunswick, in the minimum security unit at Grand Valley Institution for Women, and in the maximum security unit at Collins Bay Institution. BCFI has expanded from a handful of participants in a small Ontario penitentiary to a nationwide project that has reached the lives of thousands of inmates. Looking forward, our goal is to establish book clubs and reach inmates in every federal penitentiary in Canada! Copyright © Book Clubs for Inmates.